K.J. 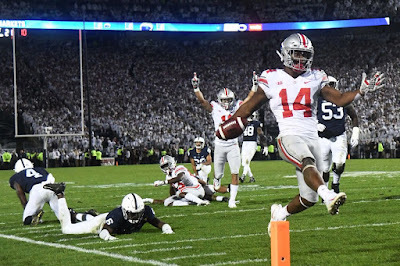 Hill sped into the end zone for a touchdown from 24 yards after catching a Dwayne Haskins screen pass for the second of the two fourth-quarter Haskins touchdown passes with two minutes remaining to erase a 12 point deficit and stun a sellout in State College for a 27-26 Ohio State victory over Penn State. Dwayne Haskins finished with 270 yards with three touchdowns and an interception on a tipped ball, but the true star of the game was defensive end Chase Young, who finished with two sacks, a batted down pass on a key Penn State fourth down and the stuffed running back on the fourth down carry by Miles Sanders that clinched the game for the Buckeyes. Ohio State moves to 5-0 (2-0 Big Ten) and will host 4-1 Indiana next week for Homecoming. 1) Even though the Buckeyes struggled often during this game, only when Penn State scored midway through the fourth quarter to move ahead by twelve points did I begin to become really discouraged. I actually felt better at halftime with so much going Penn State's way as far moving the football to be only down 13-7. 2) The game swung a bit late in the first half when Ohio State forced a fumble that Dre'Mont Jones recovered in Penn State territory. The short field allowed the sputtering Ohio State offense to score their only points of the half when Dwayne Haskins beat the blitz on a short pass to J.K. Dobbins, who then raced twenty-six yards into the end zone for the score. Up to the point, Ohio State had not seriously threatened and the touchdown allowed me to feel better as I mentioned above at the half. 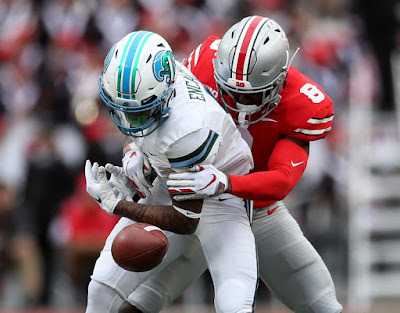 3) The Buckeyes took another hit to their defensive line as Dre'Mont Jones left the game with an injured ankle, but he would return to play late in the game. However, Jones left the locker room in a walking boot according to Eleven Warriors and is questionable for Indiana next Saturday. 4) Isaiah Pryor was ejected in the fourth quarter for a targeting penalty that knocked K.J. Hamler from the game. Pryor's contact was to the head of Hamler and with the shoulder, not head to head, but by the rule, the call was a fair one. The issue with the targeting call is not about trying to avoid contact with the head, it is the lack of consistency with the rule itself. The rule would be easier to take if they kept the helmet to helmet portion, but eliminated the other types of contact and added intent to injure for the requirements for the call. 5) Ohio State lost three points in the third quarter when Luke Farrell was called for a facemask as Sean Nuernberger connected from 33 yards away. The penalty (which I didn't see as I was driving to work) forced the points off the board and Nuernberger's resulting attempt from 48 yards was no good. 6) I'll end the negatives with this note- Penn State did an excellent job in rushing Dwayne Haskins and forcing him to get rid of the ball early, but I was disappointed in the passing game not taking more shots downfield. It seemed to me that the playcalling was stuck in the J.T. Barrett age and didn't take advantage of the different skills of Haskins, but it does seem that there is something about playing at Penn State that turns Urban Meyer into Woody Hayes. Trips to Happy Valley usually results into the offense playing things very close to the vest and conservative and often that can get you beaten against a lesser team in a loud stadium. 7) Dwayne Haskins showed on the final drive why he is going to receive Heisman consideration and why he is likely to leave at the end of the season. Poised in the pocket and throws that had both steam and touch as well as accuracy, Haskins shows the skills that will make him a high draft pick. although returning next year would be better for his development. Young was strong in rushing Trace McSorley (two sacks), wasn't afraid to drop back in coverage (a key fourth-down pass was knocked down by Young) and finished the game off strong against the run when he stuffed Miles Sanders to finish off the game. Bosa and was the best player on the field. While Nick Bosa has a chance to be the first pick in the 2019 draft (depending on the need of the team selecting first), don't be surprised if Chase Young is in the same situation in the 2020 draft. Entering next season, the Buckeye that everyone will be talking about will be Chase Young. 9) I know Penn State had a sizable lead in offensive yardage. (492-389) and the difference was the inability to stop Trace McSorley do the one thing that makes him a dangerous QB- run draws and moving away from the pass rush. Tuf Borland was mentioned early in the game as being assigned to "spy" on McSorely and make sure that he didn't do what it turned out that he would do effectively and either Ohio State decided to get away from that idea or Borland (who did cause the second quarter fumble that led to the first Buckeye score) was caught up in space as he was when McSorley ran for a 51 yard gain in the first half. It feels like the boss or parent that says "I just asked you to do one thing"! I've been critical of McSorley through the years and particularly for his "chuck it up and pray" passing style, but he was tremendous on this evening and deserves Heisman consideration should Penn State win out and he can maintain this level of play. 10) I loved the TD pass and run by Binjamin Victor that quieted the Penn State crowd and turned the game into a one-score battle. Victor could have easily gone down on contact or even stepped out of bounds at one point, but instead, he kept moving, extended the play, made some Lion defenders miss and turned what could have been a modest catch for a first down and turned it into six points. I've always thought that of his particular recruiting class that Victor is the one with the highest potential to be a star. 11) J.K. Dobbins scored twice (one rushing and one receiving), but his 57 yards (3.4 average) doesn't seem all that impressive. Don't be fooled and read beyond the scoresheet, Dobbins ran very well in the second half, wasn't afraid to put his shoulder down and run with power. Until the final two drives, you could make a real argument that Dobbins was keeping Ohio State in the game on the scoring drive in the third quarter, the drive that resulted in the missed field goal and moving the chains otherwise. 12) I've been concerned about the secondary all season and the school record 93 yard touchdown toss and run from Trace McSorley to K.J. Hamler showed why when Hamler just blew by the defenders (give credit to someone, who chased Hamler all the way down the field and his dive just missed him, I can't name him because I've not rewatched the game yet), but it could have been worse. The one handed catch by Juwan Johnson was just one of those great plays that happen as Damon Arnette couldn't have had better coverage and other than that the Buckeyes managed to avoid giving up the huge yardage plays that had haunted them at times against lesser competition. 13) Penn State fans have some reason to be upset with the coaching staff and James Franklin. Yes, the final draw play was a weak call, but there were other mistakes during the game that have to have Nittany Lions fans wondering. Franklin passed on a long, but makeable field goal (41 yds) in the third quarter to go for it (this was the Chase Young batted pass play), and burning timeouts before that final running play, so the Penn State defense would not have to make Ohio State make a first down to end the game-BUT that wasn't all as Franklin tried to go after a critical Penn State fan after the game, delivered a bizarre press conference in which he claimed Penn State "was great and satisfied being great" while Ohio State was "elite" which is where he is going to be or drive everyone crazy trying. That wasn't even all as Franklin then threaded his players lack of commitment to "Going to class consistently so coaches don't have to babysit them". Franklin might have had a span of time that ranked with the worst at Penn State going back to you know what and I wonder how Penn State deals with this if this leads to a lesser season that their fans expect. 14) Finally, the most difficult road game is over and the Buckeyes escape with a win. Yes, the November road trip to East Lansing will be difficult and after last year's Iowa debacle, no one should take any team lightly, no matter their record ( I can say that because OSU has already played Rutgers). 4-1 Indiana is next at home, but their best win is over Virginia and struggled to a seven-point win over Rutgers yesterday- the same Rutgers that had allowed 97 points the previous two weeks in losses to Kansas and Buffalo. 3-1 Minnesota is next, but they lost their last game to Maryland in a blowout and will visit Columbus coming off a rivalry game vs Iowa. If you are looking for a trap game, try at 2-3 Purdue under an innovative head coach in Jeff Brohm, Purdue Pete blew out ranked Boston College and then Nebraska in their last two and their three losses are by combined seven points. The Purdue game leads to a bye week to end October so one would think, although guarantee nothing that Ohio State will hit November's four games at 8-0. Back with another edition of the PPM with some excitement for the Browns and the Buckeyes playing in State College for their biggest road game of the year. The big news in the world of boxing wasn't the final of the World Boxing Super Series or even the beginning to flag backlash over the controversial Canelo Alvarez-Gennady Golovkin decision, which was replayed last Saturday night. The biggest news of all came from the network that televised the replays as HBO (Home Box Office) announced that they are stepping away from the boxing business following the 2018 year. The departure sees the self-proclaimed (and able to often back it up) Network of Champions walk away after 45 years of televising boxing since their first telecast in 1973 with the shocking upset of George Foreman knocking out Joe Frazier in Kingston, Jamaica. The network that has supplied the majority of boxing memories over the last thirty years is now gone and Larry Merchant told Steve Kim (Steve's words on the decision can be found here) in the best manner that I've heard yet- "HBO knocked the networks out of boxing, but now they are facing Amazon, Hulu. Netflix and other challenges". In other words, as Steve tweeted- "HBO is Blockbuster Video"
Which means at one time, it was the 500-pound gorilla, but it was not able to adjust to changing times and new technologies. I'll refrain from a recap of the terrific fights over the decades that were brought to you by HBO and save that for a few months when HBO actually steps away which will either be in October after the IBF middleweight title is filled by the winner of the Daniel Jacobs-Sergey Derevyanchenko bout or for a rumored November Dmitry Bivol fight to empty the budget for 2018. Instead, let's look at how and why it happened. It happened because the innovator in boxing production rested on their laurels and didn't invest in keeping those production values at the top of the game and was content to allow the newcomers to rally from behind. It happened because HBO moved from a network that appeased Al Haymon and his powerful stable to one that eliminated doing any business with him and as a result drove his fighters to their only opposing network (at the time). I'm not saying that HBO should have continued kissing up to Haymon, heaven knows that HBO televised far too many uncompetitive and frankly. squash matches in their time with Haymon, but disposing of him entirely started the path to their own destruction. It happened because through either a power play or just a miscalculation of personnel with the broadcasting team when Max Kellerman replaced Larry Merchant. I was totally on board when Kellerman was hired by HBO but thought he would have been a terrific host rather than pushing Merchant out as a color commentator. While Merchant would have been wonderful in a "Jack Whitaker" role on each broadcast, reflecting on the evening's events and perhaps attaching it to something to the game's past and history, HBO instead moved Merchant along period in order to perhaps have no one around for viewers to compare to Kellerman, who quickly turned from boxing historian to one with an agenda of pushing fighters that he personally approves of in the ring. Merchant was opinionated, but he was never biased. One couldn't say the same about Kellerman, which became apparent with each broadcast. then played subtle heel by turning his volume up and even more often with what many observers found irritating. HBO employed the best blow by blow guy in the business in Jim Lampley and like a basketball team content to surround a great player with a weak contributing cast, it became difficult for that star to overcome all challenges. The Merchant for Kellerman trade is truly where the HBO broadcasts began to "Jump The Shark"
It happened because HBO never moved beyond its basic boxing options. 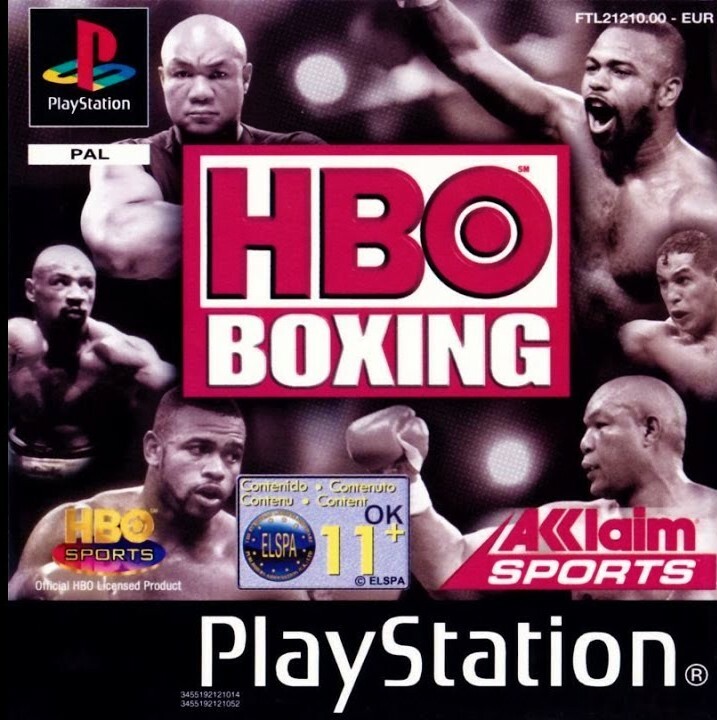 While Showtime invested in young and promising fighters with their ShoBox series, HBO only used their HBO Latino outlet on scarce occasions for boxing in what would have been a natural fit and HBO never showed any undercard bouts on their satellite networks, while Showtime showcased their fighters often to expose young talent to the audience and offer a lead-in to their main program. Those fights cost next to nothing to televise as it's as simple as turning the cameras on and yet HBO never seemed interested in doing any different. With DAZN and now boxing available on Facebook, how was HBO going to handle fresh and new ways of reaching the boxing audience when they couldn't even deal with Showtime with a similar presence and smaller pocketbook? It happened because HBO got away from what made them elite- telling stories and making you care. I've written before that Cherie doesn't like boxing and it's the one sport that I have a passion for that I have never been able to swing her over to, but she always liked watching those so well-done profiles on the fighters before the bouts. They made you care and when you care (like or dislike), the interest grows and you'll be back to watch them next time. HBO slowly moved away from those profiles before the fight in favor of the 30-minute specials, faceoffs and other infomercials and as a result, those connections weren't made beyond the boxing base. Who else would televise the challenge for the heavyweight title by 45-year-old George Foreman and begin the broadcast with Foreman singing "The Impossible Dream"? OK, Big George spoke more than sang in a Shatneresque performance, but it set the stage for the evening and a night that we will all remember. HBO made you care about what was regarded as little more than a sideshow with a punchers chance and delivered the drama. It happened when they signed the wrong guys. HBO signings of Andre Ward type fighters that delivered dominant, but dull wins and sent viewers scurrying away were not helpful, but even worse decisions when they signed the right guys like Gennady Golovkin and Sergey Kovalev and were unable to match them against good competition on their network. HBO essentially had two levels- exciting fighters that were rarely challenged and skilled fighters that put you to sleep while being rarely challenged. In either case, the product began to slip with too many Sergey Kovalev-Igor Mikhalkin's and not enough Srisaket Sor Rungvisai-Juan Francisco Estrada's. And finally, it happened when Time Warner merged with AT&T and in hindsight, that is where the end began. The announced merger and resulting suits and challenges that only recently were settled saw HBO"s boxing budger drastically cut in 2017 and 2018, weakening the ability to buy bigger fights, fight off the new challengers and continue to bulk up a flagging roster. The commitment was waning along with the budget and the desire to turn things around simply wasn't there. Similar to when Time Warner merged with AOL years ago, the new people in charge didn't like professional wrestling and shortly after, WCW was off television on the Turner channels and was soon to be sold. HBO, of course, isn't going to be sold, but I'd wager that new bosses and new decision makers aren't boxing believers and where the will to succeed isn't there, it's tough to survive. HBO boxing was our flagship for a long time and a real argument can be made that without HBO for the last 25 years, the boxing is dead crowd would have a far better case than they have to state. They'll be missed, but the time seems to be the right one for the dramatic exit.. The boxing challenge continues with most of the bouts on Friday, so this post is earlier than usual. I am also working on yet another boxing post on the end of the line for HBO Boxing that I'm hoping to have up within the day. 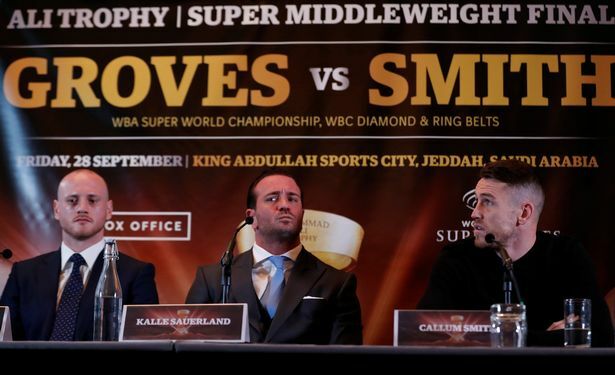 The World Boxing Super Series finally wraps up their first season as the super middleweight finals finished with an all-British battle held in Jeddah, Saudi Arabia? Well, yes- Jeddah, Saudi Arabia in a decision to place the fight there and not the UK that the promoters are likely kicking themselves for. The delayed final was due to a shoulder injury suffered by George Groves in the final round in his victory over Chris Eubank Jr and despite the tournament flirting with placing Eubank in the finals due to the extra time for Groves to heal, the organizer did the right thing and allowed Groves until September under the conditions that if it looked like he wasn't ready to go by then that Eubank would step in for him. 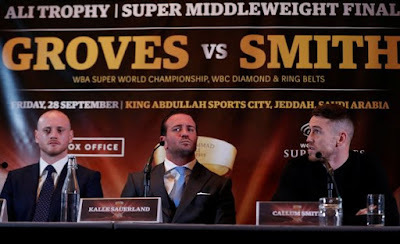 The super middle bracket wasn't nearly as exciting as the cruiser tourney and no titles will be unified, but the final is still an interesting one as WBA champion George Groves defends against Callum Smith. Groves, who continues a run of wins since his split decision win over Badou Jack, defeated Jamie Cox and Chris Eubank Jr, (in the only battle of top ten fighters in the tournament) to reach the finals, while Smith defeated unknown Swede Rob Skoglund and late replacement Nicky Holzken to cruise through his side of the bracket to set up the championship. I've been torn on this fight. I've always rooted for George Groves through his various near-misses against Carl Froch and then Badou Jack and Callum Smith is very untested even considering his being in the finals, so it was pretty clear that I favored Groves to win. Then came today's weigh-in and Smith made weight, but just looks physically huge! Smith looks like he is a full division larger than Groves and that has me thinking that perhaps this is a much bigger (and happens to be younger) man that now I'm thinking about Smith. It's a close call and should be a good one in Saudi Arabia. Chris Eubank Jr returns on the undercard against journeyman JJ McDonagh. Eubank was the on-call fighter in case of an issue with Groves or Smith and was matched lightly to be prepared in case of emergency. Uzcategui was training for a title bout against mandatory contender Caleb Plant when Plant suffered an injury, so Uzcategui's team decided to take this bout to stay busy. Jerwin Ancajas defends his IBF junior bantamweight title against Alejandro Santiago in the co-feature. The final bout is on Saturday on Facebook as former two-division champions Jorge Linares returns to the ring for the first time since his loss to Vasyl Lomachenko in a move to 140 pounds against fringe contender (and cousin of Miguel) Abner Cotto. In the boxing challenge, Ramon Malpica has been narrowing the gap, but I still hold a 144-123 lead. Boxing appears to be on its way back into the American sports landscape. Oh, maybe not to the degree that it was in the 1970's and 1980's, but recent television agreements with major networks such as ESPN (Top Rank and to a far lesser extent Golden Boy) and Fox (PBC) have returned the sport to the "free" television tier along with Showtime (PBC) continuing to raise their boxing budget every year, the new streaming access with DAZN's (Matchroom) huge wallet and with whatever HBO (Golden Boy/Unaffiliated promoters) is doing to hang around in the game, to bring a level of exposure and interest that haven't been seen in a long time. However, with that exposure that hopefully results in new fans and viewers comes the responsibility of acting like a legitimately run sport and there is where boxing has to be careful in just how far they push the line with a lack of responsibility. Take, for example, the now-canceled bout that was the scheduled main event on FS1 on Sunday between long-time Zabbie contender Victor Ortiz and the fading former contender John Molina. Molina has seen better days but showed in his last fight (a four round war against Ivan Redkach) that he can still be exciting if matched properly against a similar level of fighter. Ortiz, for all his disappointments and inconsistencies, has proven to be that same level of fighter and even though the matchup was one of name value, if not one of solid current contenders, I was still looking forward to seeing the fight because for as long as it lasted, it should have been a "slobber knocker" as Jim Ross used to say on Mid-South Wrestling. Then, with less than a week before the fight, Ortiz was accused of sexual assault from an incident in March- with the result being a canceled fight. Putting aside guilt or innocence and any comment on the fight being canceled or Ortiz being allowed to fight ( it was a good idea to have Ortiz not do so under the conditions), but Molina misses out on a payday, the card now lacks the previous 'star power' and even though the card goes on and will be televised, the casual viewer will look through their "tv guide" and still see the names of Ortiz vs Molina and then be disappointed to see neither of the two in the ring. While I'm sure that it was difficult to find an opponent on short notice at all, let alone with the reputation of Ortiz, boxing takes a hit again compared to the stick and ball sports. On those schedules, one doesn't have to worry about the Chargers getting in legal problems and not being available to play the Chiefs, or their game being canceled or even the Chargers being replaced by a minor league team to battle the Chiefs on short notice. 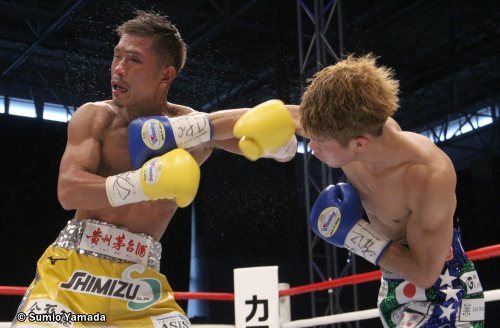 Another battle that boxing faces with bout cancellation come with the increasing problems with fighters making weight. This has always been and always will be somewhat of an issue as fighters struggle to make weight, but the change years ago to have weigh-ins the day before the fight has hurt fights being able to be completed. The day of fight weigh-ins aren't perfect with what can result in weakened fighters, but the advantages to an extra day to make weight and not having that extra day for fighters to bulk up into what is sometimes two or even three divisions higher in weight is worth the change. I know about the rules to protect the fighters safety, but I still think a fighter that struggled to make weight facing someone their own size is safer than one that struggled to an extra day to make the scale but will be facing a far bigger opponent than he signed to face. Making weight was an issue in the past, but very rarely did fights get canceled. Usually, the weight was made with the extra time and in the cases that a fighter didn't, a deal was made. Deals are still made today, but with the fighter that was a professional and lived up to the contract at a disadvantage with the offending fighter being able to stay stronger, it is more often than not for the fighter that made weight to refuse the fight, especially with the emphasis on avoiding a loss in the game today. Boxing has another issue dealing with weight- far too many weight classes. Honestly, for all of the hits that boxing takes for having too many sanctioning bodies ( and they do), the bigger issue and problem for making the best fights are too many weight classes. While boxing has outgrown its original eight weight classes, there are many classes that could easily be moved along without a loss to the game. Between the four sanctioning bodies ( I could live with two, with unification preferred when possible) and the seventeen weight classes (that's right-SEVENTEEN! 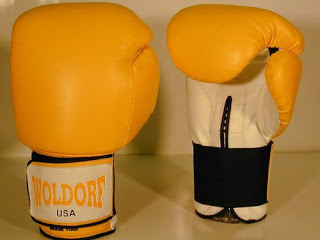 ), it is far easier now for a champion when faced with a stern test from a mandatory contender, especially if said contender fights for another promoter, to simply toss their belt aside to move up a few pounds and quickly fight for another championship. This is a tactic used most skillfully by a champion in the WBO's system with their rule that a champion of theirs moving up in weight, automatically becomes the number one contender in their new weight class. The rampant epidemic of changing classes rather than cleaning one out before leaving one has resulted in numerous four and five division champions creating statistics that no one outside of the boxing game and few inside of it cares about. Comparing the current situation to the highly anticipated challenge by Alexis Arguello against Aaron Pryor record-setting setting fourth division title and one can easily see how little the current achievements are usually regarded. Vasyl Lomachenko is arguably the top boxer in the game today, has faced several top fighters and has ducked no challenges, but in only 12 professional fights, Lomachenko has already won three divisional championships, which shows not only that four sanctioning bodies in each weight class make titles easier to win, the available divisions make it easier as well. I'll be writing a post soon on how I would correct the divisional problem although it would have no chance of being adopted. The sanctioning bodies and their ridiculous 'secondary' titles (The WBA is the worst offender with it's Super, Regular and Interim titles, but the WBC's Silver title is another rotten one) are polluting the sport and this comes from someone that favors titles and believe that they are important for fighters and fans, but with boxing having the opportunity to bring fans back into the fold with increased exposure, boxing should grab that time to make things clearer for new followers and to make championships mean something again. the time is still right for fans to look at someone and think there is the champion of the world- not wondering what he is the champion of and how many other champions there are. In other words, our sport needs more professionalism from top to bottom- it comes with the territory when you want to be considered more than a niche' sport. I'll have the boxing challenge later tonight with the World Boxing Super Series final between George Groves and Callum Smith being held on Friday afternoon in the Eastern U.S. Early yesterday morning at 3 AM, while most of the country slept, I was treated to live coverage of what might be my selection for the fight of the year from Nagoya, Japan as Kosei Tanaka defeated Sho Kimura via majority decision to take the WBO flyweight crown from Kimura. I had Kimura a 115-113 winner, but so many of these rounds were close, I had no problem with the decision going Tanaka's way. I can only hope that we see a rematch between the two and that it is soon! as I decided that the round that I scored even when I watched the first time, should have been given to Canelo when I wanted to make a decision one way or the other. That means on my card, I gave every close round to Canelo Alvarez and I still have Gennady Golovkin as the winner. The wrong man (Alvarez) won a close, exciting fight and even though the operative word is close. the result still meant the wrong team lost. Normally, I'd say the less said the better, but this was a special kind of broadcast- as in the type that should have featured Vince McMahon and Bruno Sammartino extolling the virtues of Ricky Steamboat as Jesse "the Body" Ventura pointed out the positives of whatever nasty bad guy happened to be pounding a hapless performer at this particular minute. All of that sounds like a writer's hyperbole, but here's the issue for me. HBO didn't have a Ventura to represent Golovkin. Jim Lampley tried to call it down the middle, but as the blow by blow man's job to always be fair, Lampley isn't offering analysis of why things are happening or how he sees the fight developing, his job is to describe what is happening. Even still, Lampley appeared to be (during the fight) to trying to thread the needle that his network has set up involving their last true cash cow that the one-time bully of the boxing business has remaining in a time of spreading boxing back into various platforms and didn't always seem to call it as it happens. Lampley would somewhat redeem himself (although his saying the round 12 that almost all scored for Golovkin was difficult to score- it was not) with his editorial on his "Fight Game" show that talked about the various problems in boxing that come to light whenever these decisions in big fights pop up, but sometimes these statements come too little and too late for an audience that feels ripped off and cheated of the ending that observers feel should have happened. Even still, Lampley dropped Golovkin completely out of his top five in his "Pound for Pound" despite the controversy to lift Alvarez to third. While I certainly could understand Alvarez being rated over Golovkin because of the official win, dropping him out of the top five seems like a stretch, especially behind Mikey Garcia, who has been more workmanlike than wizardlike in his two most recent wins. For the small issues, one might have with Lampley, who is being pushed for his longtime position as the best blow by blow man in the game by Brian Kenny of DAZN, the far more serious issues are in the color analyst roles in which are receiving more vitriol than any commentators in boxing than I can remember in years. Roy Jones Jr has always been a commentator that was more about promoting himself than one skilled in analyzing the fight in the ring, but his work of late seems to have transitioned into a role of providing "Roy/Pensacola/More Roy" stories and rooting for the fighter that HBO has the most interest in. That's part of what HBO has always wanted in the role through the years moving from Ray Leonard to George Foreman to now Jones and freelancer Andre Ward, so that's nothing new as far as the expectations from the front office. The surprise has been the transition from the sage writer Larry Merchant to Max Kellerman. Kellerman was thought of by many (including myself) as being the natural successor to Merchant and despite a slightly clumsy replacement process, Kellerman's knowledge of the history of the sport was thought to be a great fit. It hasn't turned out that way as Kellerman's affinity for a certain type of boxer that has existed dating back to his first exposure on ESPN has turned into what has become an out and out bias against fighters that not only have a different style but ones that actually fight against fighters of Kellerman's preferred style. Kellerman has become so strident and blatant in his rooting for these fighters (Most notably Andre Ward, who he feels compelled to mention multiple times in each fight, whether Ward is announcing the bout or not) that it is becoming a massive hindrance to the broadcast and a major repellent to the audience. While I was a fan of Kellerman and still would not at all knock him for a lack of knowledge of the sport that he covers, Kellerman has become part of the debate-oriented television style that has become so prevalent in both sports and news coverage. Kellerman's opinion usually does not divert from those of Jones, but he seems to be looking for a reason to shout and exchange with- even if his usual foils at ESPN are nowhere to found. The foil seems to have become the viewer, who often seems to wish that they could rail back at Kellerman. HBO once had the best of almost everything in boxing production from graphics, talent both on and off the screen and the best of the boxers themselves. Now, the Network of Champions seems to have slipped past their prime like a once-great boxer that keeps trying to survive through gimmicks and guile against younger and more innovative opponents that read Showtime, DAZN, and ESPN on their marquee's. It's always sad to watch any athlete go on past their prime and continue with nothing left. It was a two fight weekend in the boxing challenge from London and the fights were both entertaining. In the main event, Anthony Joshua rallied from behind on my scorecard to knockout Alexander Povetkin in the seventh round and retain his WBA, IBF and WBO heavyweight championships. Joshua looked tentative and Povetkin landed often early as he bloodied the nose of the champion in round one. Povetkin was far more aggressive in this fight than he was in his only previous career defeat, a decision loss to Wladimir Klitschko and that aggressiveness allowed him to build a lead on my card of 4-2 at the midway point of the bout, with it arguably being 5-1 as Joshua narrowly won one round on my card that I "asterisked" as a round that could have been given to either fighter. However, in the sixth round, you began to feel that Povetkin had fired his best shot as Joshua put together his best round of the fight as things began to swing towards the champion's corner. Joshua took advantage in the seventh by dropping a badly hurt Povetkin, who almost tumbled out of the ring as he hit the floor and barely beat the count. Povetkin attempted to survive, but Joshua leaped on the Russian and finished him off with a combination that sent Povetkin's cornerman onto the apron to stop the bout just as the referee waved off the ending. Give credit to Povetkin, who has been criticized throughout his career for his two failed drug tests and his anemic effort vs Wladimir Klitschko, he fought hard and with bravery when he could have packed it in after the first knockdown and a little to Joshua for taking the best shots of a more than solid puncher and rallying to win. Why only a little to the victor and still champion? Well, to start with and this isn't his fault, all three judges had Joshua ahead, so had things continued along the lines of the first six, Joshua was on his way to winning a questionable decision. However, the main problem and this is a marginal complaint considering he decisively knocked out a guy that had never been knocked before, is that the Klitschko fight that we all love so much has changed Anthony Joshua as a fighter. Joshua's exciting win and resulting knockdowns at the hands of Klitschko has led to change in style, much like the last great heavyweight from Britain- Lennox Lewis, who transitioned from an exciting fighter (check his fight vs Ray Mercer out) to a more conservative, but arguably more effective boxer after beginning to work with trainer Emanuel Steward. The change in style turned Lewis into a far less interesting fighter to watch, but it protected a vulnerable chin far better and Lewis became a Hall of Fame level fighter and I see the same in Anthony Joshua. Joshua and his team are discovering that almost any top ten lever fighter has the ability to take you out, so why test that theory? Joshua will be arguably (he sure wasn't in this one, in my opinion) more effective and take fewer punches, but he won't be nearly as much fun to watch. 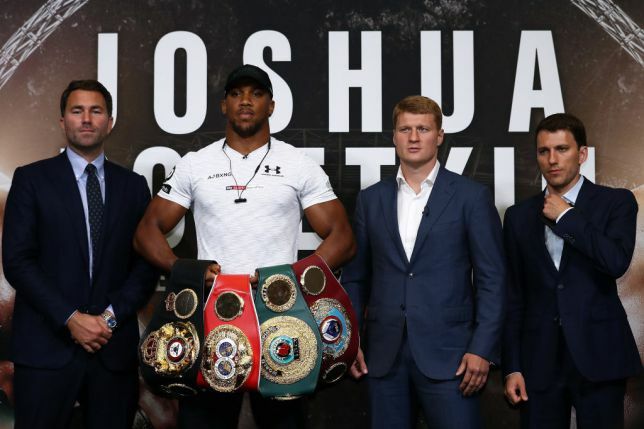 Fans are hoping to see the final title unified with Joshua facing the winner of the WBC title match between champion Deontay Wilder and the lineal champion Tyson Fury next year. Should that not happen, a rematch with top contender Dillian Whyte is the likely next title contender to try Joshua. Whyte badly hurt Joshua in their first bout before Joshua knocked out Whyte in the seventh. In the co-feature, Luke Campbell avenged a loss to Yvon Mendy via unanimous decision to become the mandatory to WBC lightweight champ Mikey Garcia. Campbell had lost their first bout via a split decision but controlled this bout (118-110 on my card) via the jab and staying outside against the perpetually charging Mendy. Campbell is unlikely to fight Garcia, mainly because he won't bring Garcia "I'm only looking for big fights" sizable dollars and there would be promotional issues involved (Campbell is with Eddie Hearn's Matchroom, while Garcia is loosely affiliated with PBC and Showtime) in making the fight. Campbell would be likely to fight for the title after Garcia would likely vacate it rather than defend that title against Campbell, who lost a split decision to then WBA champion Jorge Linares in 2017. In the boxing challenge, Ramon Malpica continued to gain ground with a four-point weekend (two points for each fight) to my three-pointer (Two for Campbell and one for Joshua). The tally now stands at 144-123. This card was also my first as a DAZN subscriber and I have a few words to write about the broadcast. The stream looked just as strong as an HD broadcast (Which has always been a streaming concern of mine) and although there was an occasional buffering issue, that could have been my having a few windows open as I followed the Ohio State game etc. The graphics were large and easy to read, yet they weren't obnoxious or bothersome. Amazing how easy that can be and just as amazing is how so many screw it up. The bigger issue was the broadcast crew. Brian Kenny is very good on blow by blow and his knowledge of the game as a historian comes through very well. I would wager that if DAZN is able to keep Kenny busy enough with enough work that he could challenge Jim Lampley for the best in the game in that role. I would already slot Kenny ahead of both Mauro Ranallo of Showtime and Joe Tessitore of ESPN, so Lampley might have to step his game up to stay in the top slot. The color commentators are where DAZN shows a need to improve. Sugar Ray Leonard was an all-time great in the ring, but he hasn't been regularly at ringside since he left HBO in 1990 and it shows. Leonard offers the same cliches' that he used in the 80's and for all the charisma Leonard had in the ring, he has never seemed to possess the same zip behind the mic. Sergio Mora is another semi-active fighter giving commentating a try while he still occasionally fights. Sadly, Mora has fallen into the trap that so many have fallen into- being critical while commentating of things that you did or didn't do in the ring. An example came in a prelim fight when Mora was critical of one of the fighters for holding so much and the referee for not deducting points. I found this laughable because Mora is a fighter that holds constantly in his bouts and frankly is a perennial Zabbie Award contender. At a time where the color commentary position is very weak other than Showtime's excellent pair of Al Bernstein and Paulie Malignaggi, DAZN could have leaped over HBO's increasingly shrill (and partial) Max Kellerman/Roy (Let me tell what Roy would have done here in 1991) Jones and ESPN's pairing of Mark Kriegel (Love his writing, below average at ringside) and Timothy Bradley and freelancer Andre (challenger to the Roy Jones- it's all about me award) Ward to make themselves a top-notch unit. Perhaps over time, they can tinker with personnel at those positions. I really liked Chris Mannix as part of the hosting pairing. Mannix is unafraid to offer opinions and came across well on TV. I hope to see more of him. I really don't know much about Kay Adams, who works for NFL Network, but I'm usually skeptical about new media folks involved in boxing. Adams stumbled a bit on a few occasions, which makes me wonder if this is another television person shoved into a boxing role rather than a boxing person doing television. I was critical of the various PBC hosts a few years back when they were buying half of the cable networks for their shows for lack of knowledge (Most notably ESPN's Marysol Castro) or someone dating a fighter with the company, so although I don't know enough about Adams to say for sure yet, but if I had to guess, she could be along those lines. In a sport with Brian Custer (Showtime) Crystina Poncher (ESPN/Top Rank) and Jessica Rosales (ESPN/Golden Boy) that are solid boxing people with excellent hosting capabilities, I would like to see DAZN use a boxing person in the role rather than just another sports anchor. After all, they will be surviving on a subscriber base, it's not too much to ask that the people paying for their product have someone that is as passionate about the product that they pay for hosting the event. All in all, there are some things that I'd change, I found that I liked DAZN's presentation and would recommend it to the huge boxing fan. I passed last night on the HBO replay of the Golovkin-Alvarez fight due to watching college football and some things I needed to do at work. I will be watching on demand tonight, mainly because I want to re-score the fight again, but also because I have heard some many bad things about the commentary of Max Kellerman and Roy Jones ( my fight broadcast was in Russian) and I want to hear just how fair they actually were. No Browns today, so looks like some features coming your way over the next few days!! Buckeyes blast Tulane in Meyer return. Dwayne Haskins threw for five touchdowns and for over 300 yards as Ohio State washed over Tulane 49-6 in the return of Urban Meyer as the head coach. The now 4-0 Buckeyes face a severe test next Saturday night in State College with the waiting and also undefeated Penn State Nittany Lions. 1) This will be a far shorter review than normal because being honest, I didn't watch the game as closely as normal with the Joshua-Povetkin fight being on at the same time and the overmatched opponent. What can I write that I haven't of late? The only real question for Haskins will come next week in the whiteout conditions of State College, if Haskins plays well and leads Ohio State to a win in that environment, there would be no further questions to answer. 3) Ohio State played the second team for almost the entire second half, which gave those players some time on the field, but the Buckeyes would score just one time, late in the fourth quarter on a Tate Martell run. 4) That was made palatable by the touchdowns that the Buckeyes scored on all six occasions in the first half. Against a team that isn't on your level, that is how you eliminate any upset possibilities. Don't believe me? Ask a top 15 Virginia Tech team that was defeated yesterday by a 0-3 Old Dominion squad. 5) Eleven Warriors is reporting that Ohio State is considering a plan to make Ryan Day the "Head Coach in Waiting". This would be a way to keep Day as offensive coordinator for a while, have a quality successor ready for whenever Urban Meyer decides to leave and the most important reason- it would keep Day in the fold and away from a potential job that he might become a challenger to Ohio State. It's early in the year, but there are a few possible Big Ten openings for Day should he be interested. to remove James Franklin from Penn State. The coach in waiting doesn't always work out (Remember James Franklin with Maryland? ), but it would be a worthwhile attempt to keep an excellent young coach. It's a two-fight weekend in the boxing challenge and you can watch them free online as the introductory offer to DAZN includes a free month. The main event sends the three belt holder in the heavyweight division against a solid contender live from London. 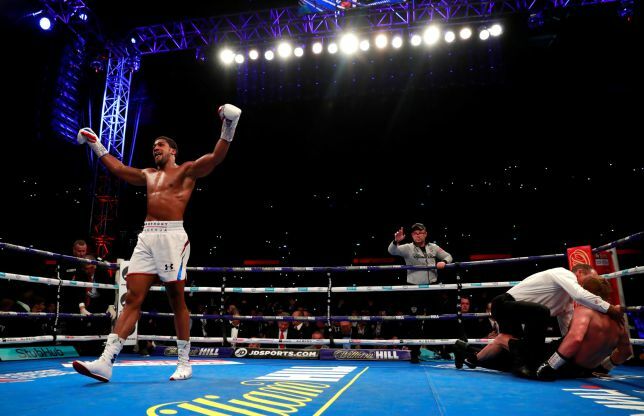 Anthony Joshua defends his WBA, IBF and WBO championships against former WBA champion Alexander Povetkin, who has lost just once in his career in a unification match by decision to Wladimir Klitschko. The battle of Olympic Gold Medalists (Povetkin 2004, Joshua 2012) is one between two of the top five heavyweights in the world, so even though it's not the wished for Joshua-Deontay Wilder, it's still a top five title defense. Joshua is the bigger fighter and a harder puncher, although Povetkin is no slouch as a hitter himself and he punches as well, if not better than Dillian Whyte, who floored Joshua in their bout. Joshua also memorably was dropped by Wladimir Klitschko in their classic conflict, so Povetkin does have a punchers chance in this one, so Povetkin is a real dark horse here. However, in Povetkin's only appearance against elite competition against Klitschko, Povetkin was knocked off his feet four times (although not seriously hurt by any of them) and was bullied and worn down by the physically larger Klitschko in arguably the dullest heavyweight unification fight ever (Mike Tyson-Bonecrusher Smith is a strong challenger for that award), so we will see just what Povetkin brings to the table other than that puncher's chance. In our other challenge bout, Briton Luke Campbell attempts to avenge one of his two career defeats in a rematch against Yvan Mendy of France. Mendy won a close split decision in 2014 when the pair first fought, but this bout has a lot on the line as on paper it is an eliminator for the WBC lightweight title currently held by Mikey Garcia. In reality, the fight is to guarantee a shot at the vacant title as Garcia is unlikely to defend against either fighter and is more likely to vacate, although I could see a scenario where if Campbell won, Garcia might be enticed to fight him in England for a larger purse than such a fight would be worth in the U.S., if promotional issues don't get into the way. Campbell is best remembered by American fans for his gritty split decision loss to then-WBA champion Jorge Linares last September. 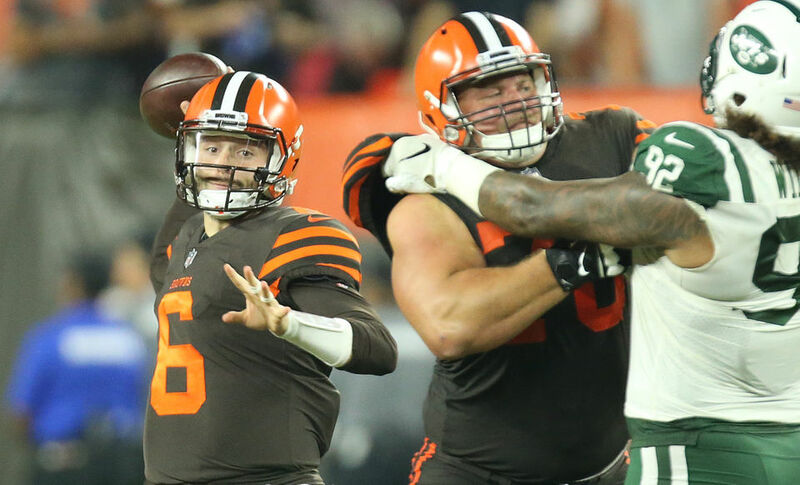 Mayfield rallies Browns-Losing Streak Snapped! Baker Mayfield made his anticipated debut for a concussed Tyrod Taylor late in the first half and made his first game a winning one as Mayfield rallied a flagging Cleveland offense and snapped a losing streak that seemed to trace back to the Truman administration with a 21-17 win at home over the New York Jets. Mayfield didn't throw a touchdown pass in his 201-yard passing night, but he did catch a pass from Jarvis Landry for a two-point conversion. Carlos Hyde slammed through the Jets defense for 98 yards and two touchdowns on the ground for Cleveland in the victory with Jarvis Landry grabbing eight passes for 103 yards. The Browns take a 1-1-1 record to Oakland next Sunday to visit the Raiders in what is likely to be their last visit ever to the Oakland Coliseum. Mayfield entered the game with the Browns trailing 14-0 and having failed to threaten at all under Tyrod Taylor, things looked less than sunny. Mayfield instantly brought energy to the field and you could feel that. I'm a person that doesn't buy a lot of that type of thing, but in this case, it was visible in how the Browns reacted to his entry into the game. Mayfield moved the Browns downfield and even though the drive resulted in just a field goal, you could again feel that the Browns were not out of this game. 2) After Tyrod Taylor underthrew two passes that could have been big plays and was anemic in completing just four of fourteen passes, Baker Mayfield's passes were sharp, didn't hang in there and were generally accurate. which of course would not be the case. 3) I've been noted as a skeptic on Baker Mayfield and I still am to a degree. We'll see what happens when the league gets a book on him and for every young quarterback that becomes a star, there is another with immediate success that isn't able to make the required adjustments to defenses that have an idea of what you like to do. However, what will be will be and let's talk about what I liked last night. The ball came out quickly, which what you hope to see and what the Browns offense was not getting from Tyrod Taylor. Every half second that you are able to save by getting rid of the football is a half second that your linemen do not have to hold onto their blocks- you make your offensive line move up a level when you can get rid of the football. 4) The other thing that I liked about Mayfield was the throws. I still don't think that he has an especially strong arm, but his throws are straight, don't hang in the air (therefore making your receiver jump for them and vulnerable to hits) and get there fast enough that receivers don't have to wait for them. From what I saw, he'll be fine in the short to intermediate passing game, he didn't make any long throws, so perhaps we'll see some of that in Oakland. 5) Remember that even though I was extremely critical of the Browns for taking Baker Mayfield, that it was more for taking him first rather than in the first round. 6) A final note on Baker for today- I keep seeing these comparisons to Brett Favre and as a Favre fan, I'd be fine with getting anything close to that, but watching the game, Mayfield brought to mind another favorite of mine and something that person said in an NFL Network program. Both were not big quarterbacks (although Baker is a few inches taller than Flutie), both are helped by a moving pocket to help them see their passing lanes and both seem to have that "it" factor that no one can describe in tangible terms , but players know if their quarterback possesses it or not. It is simple in how it sounds, but there really is something to that and that is just what Baker Mayfield might have as well. 7) Carlos Hyde ran strong, breaking tackles and moving the pile in his two-score night. Hyde had been criticized by some entering the game with a low yards per carry average, but as I noted last week, Hyde is the type of back that wears defenses down and what was keeping his average down was his lack of carries. Hyde ran the ball 23 times and responded with a big night. 8) Former Brown Isaiah Crowell scored both Jet touchdowns but otherwise was quiet in finishing with only 34 yards on 16 runs. However, Crowell was very classless in "wiping his rear" (yes, really) with the ball before firing it into the stands. I know Crowell wasn't happy with his use last season with Hue Jackson and I understand his frustration, but it wasn't the fans that didn't give him the ball to run with and yet it was the fans that Crowell decided to slap in the face. 9) The defense forced three more turnovers (2 interceptions and a forced fumble) and the best play was the strip of Robby Anderson by Denzel Ward after a completion. The Gregg Williams defense is becoming quite adept at ripping the ball loose and the Browns turned that in three points off the foot of Greg Joseph. 10) Greg Joseph drilled both of his field goals (long of 45)and even if they didn't look pretty, they went through the uprights, which is the objective. We'll see how long Joseph sticks around, but a nice start for Joseph in the victory. 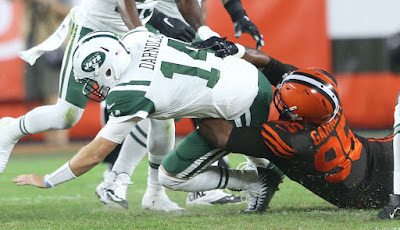 11) Myles Garrett had two sacks of Sam Darnold, but once again it was Larry Ogunjobi starring as well from defensive tackle. Ogunjobi certainly would win a most improved Brown award and at this rate, might be playing at a Pro Bowl level. 12) The color rush uniforms were a hit in my opinion. I thought the jerseys were the best that the team has worn since the sad change in togs under the Alec "I'd be surprised if our fans didn't love these uniforms" Scheiner front office, but I still think too much brown was used with the Brown pants. I'd love to see these jerseys return with either white or especially orange pants. 13) In closing, I'm glad the streak is over and the beer coolers are unlocked and we can all celebrate a win. Now it's time to start acting like a franchise should- one that doesn't go crazy over a win over a bad team at home. I tweeted last night that Tyrod Taylor's concussion might have won this game because I doubted Hue Jackson would have made the change otherwise. I really don't need to hear a bunch of kudos for Hue Jackson though. If Taylor doesn't get concussed, he is likely to stay in (IMO) and under those conditions, it's an L. Let's not give credit for a move forced by injury..
Let's see if Hue Jackson ( and Baker Mayfield for that matter) can build off this win and with ten days to prepare for a road date against another team of a similar level in the Oakland Raiders, that should be an interesting test to see just how good this Browns team is. Celebrate this one and hopefully get used to the feeling. The PPM arrives early this week with the Browns playing on Thursday night against the New York Jets. The cleaning of the inbox continues with a few notable articles to peruse at your leisure. 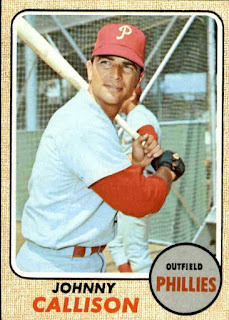 Bruce Markusen's Card Corner for the Baseball Hall of Fame starts out with a reference that I should have seen, never have previously, made me howl with laughter and will now never leave me with his comparison of the Phillies slugging outfielder Johnny Callison with the actor Edward Winter- best known to fans of MASH as Colonel Flagg! Markusen's article made me laugh with the remembrance of some of the best lines of Winter/Flagg. 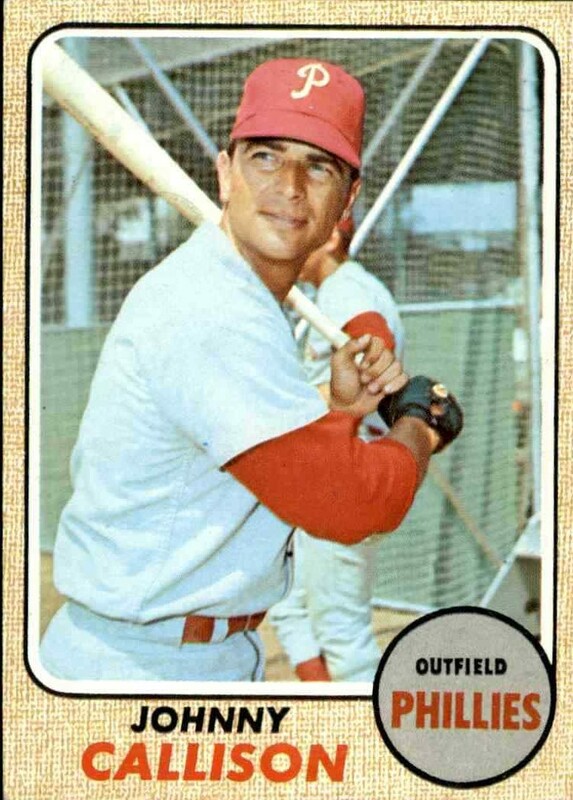 "The Wind just broke his leg" along with the career of Callison, who had the Phillies not blown the pennant in 1964, would have been the likely National League MVP. SABR is in the middle of an extensive series that looks at ownership history for each team and it is tremendously interesting to read about the attendance and the triumphs and failings of the various teams through the years. The series has just started, but the Indians and Giants have already been posted. ESPN writes about one of my favorites in Dale Murphy in a long article. Dale Murphy seems to be one of the rare people in public life that seems to be exactly as his image portrays and the article also looks at the generation that grew up watching him on WTBS. Author Wright Thompson has written several terrific articles for the Worldwide Leader. The Altoona Mirror writes about the history of the team's theme song "Everybody Loves Curve Baseball". Played every time the Curve scores a run as well as other times during the game, the song is sung by a Slovakian group and the words are written to the music of a Slovakian hit. I'm not sure that you can go to a Curve game and not hear or remember - Everybody Loves Curve Baseball. In the Canadian Football League, a huge rivalry was once played for a trophy that now isn't awarded at all. The Harold Ballard trophy was awarded to the winner of the season series between the Hamilton Tiger-Cats and Toronto Argonauts and it was named after the unpopular owner (who named it after himself) of the Tiger-Cats and the Toronto Maple Leafs. That seems awkward to start with- an owner that owns a team in each city that generally doesn't care for each other with Toronto looking down on Hamilton's working-class status, Hamilton disliking Toronto's metropolitan status along with never forgiving the Leafs for always (along with the Buffalo Sabres) foiling Hamilton's perpetual efforts to bring an NHL team to their town. Add to that the bombastic and cheap owner, it was almost as if Canada had their own "Mr.McMahon" 30 years before the heel owner existed. Last Saturday's football game between Texas Tech and Houston left me a little conflicted as the former SWC rivals played in a non-conference game in Lubbock. While I've been a Red Raider fans since I was a child, I actually watch more Cougars games now with scheduling. I did watch as a reasonably passive observer, the SWC Roundup did an excellent job at looking back at the series between the schools and their game history. I would have liked a look at their 1976 game in which both teams entered the game in the top ten in the nation and Houston's 27-19 win would be the tiebreaker in deciding which team would represent the SWC as champion in Dallas for the Cotton Bowl against undefeated Maryland. Houston would defeat Maryland in that game 30-21. We wrap with Philadelphia Magazine's ode to Mayonnaise and why it says millennials have killed that condiment. I sure would not report its demise, but then again I'm not of that age bracket either! I won't be stopping my use of it, that is a promise that I can easily keep! The Josh Gordon saga ended Monday afternoon as the Cleveland Browns traded their talented, but inconsistent wide receiver to the New England Patriots along with a conditional seventh-round draft pick for the Patriots fifth-round pick. New England only receives the seventh-rounder if Gordon is inactive for ten games this season. Gordon had 'allegedly' suffered a hamstring injury filming a commercial Friday night and showed up at the Browns practice facility in Berea on Saturday "looking not himself". Between that and the injury, the Browns had finally had enough and announced their intention to waive Gordon on Monday, which gave interested teams enough time to place minor bids in for the former Baylor receiver. Although several teams were said to be in talks with the Browns, the word is from several sources that the Browns simply took the highest offer, which was the fifth-rounder from New England, which one would figure to be a very late fifth and move on from Gordon. Gordon announced today that his hamstring was now "fine" and he expects to play for the Patriots on Sunday against the Detroit Lions. While that smells very fishy and I might even speculate that this was meant for the Browns to release Gordon, which he could then receive a larger contract from a team of his choice, the Browns being able to trade Gordon removed the plan from the table as he will now have to continue under his current contract, so the Browns may not have taken away Gordon's wish to leave Cleveland, they did make sure that he did not gain financially from his actions. 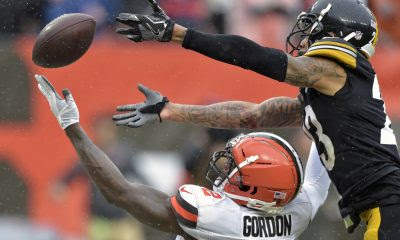 Gordon was an explosive receiver in 2013 with over 1,600 yards receiving to lead the league but has played in just eleven games since then due to various suspensions and off the field issues. The natural Cleveland thing is for Gordon to tear up the league with New England, but who really knows what Gordon has left physically (although he still shows glimpses of elite potential) and how he'll deal with any adversity at all, so I understand the appeal to New England, but I also realize how the Browns had to throw up their hands, say that they have tried it all and he just had to go. The Browns signed veteran wideout Rod Streater to the roster to replace Gordon. The thirty-year-old Streater has spent time with the Raiders and 49ers before being released by the Bills after training camp. Streater had a strong 2013 as Josh Gordon did ( 60 catches, 888 yards with Oakland), but since that season, like Gordon, Streater has disappointed as he has just 41 catches since that season. The Browns also released Zane Gonzalez as expected after yesterday's fiasco and had some potential kickers to take a look at for his replacement. The selection was Greg Joseph, a rookie from Florida Atlantic, who lost a duel with the Dolphins for their job to draftee Jason Sanders. I would have preferred a veteran that is more used to kicking in bad weather, but they must see something in Joseph, who did kick a 54 yarder among his 3 for 3 attempts in the preseason. The problem is that Joseph was successful on just 69.5 percent of his kicks in college, which isn't especially high. It's really tough guessing on kickers because who knows who is going to be successful and like relief pitchers in baseball- they can come from nowhere and be very inconsistent from year to year. One thing is sure though, they could not afford to trot Zane Gonzalez out in Cleveland Thursday and expect something good to happen, so I commend them for trying to correct a problem. Lots of pieces today and a Fightheads episode coming up as well. The TCU Horned Frogs were giving Ohio State all they wanted in the third quarter and Buckeye fans had to be wondering if their team was the next Big Ten team to be bitten with the upset bug. Four minutes later, Ohio State had scored 20 points via a long catch and run by Parris Campbell, a pick six by lineman Dre'Mont Jones and a blocked punt that set up another score and the Buckeyes were on their way to holding off the Horned Frogs in Arlington 40-28. Dwayne Haskins threw for over 300 yards and two scores passing with one rushing, while J.K. Dobbins ran for 121 yards in the victory. The now 3-0 Buckeyes host Tulane next Saturday. 1) Dwayne Haskins faced a far tougher opposing defense than he did in his debut games. TCU is fast and filled with athletes and Gary Patterson is a noted defensive guru despite playing in the fast break basketball offense conference that is the Big 12. Yet, Haskins handled them with relative ease and continued to fire the football quickly and accurately. 2) I might look back at this and wince, but if Dwayne Haskins declares for the 2019 draft- he's either the first pick in the draft or at least the first quarterback selected. Can make all throws, isn't an immobile statue and has the size-shouldn't be a question at all. 3) Nick Bosa, who has a shot at being that pick if the number one pick is held by a team with a young QB in hand, was injured in the game and will miss the Temple game. The bigger question is- will he return for Penn State and how healthy will he be when he gets there? 4) Bosa showed just how destructive he can be with his strip sack that Davon Hamilton fell on the ball in the end zone for a OSU score. I've sometimes wondered which Bosa is the better player and while Joey is setting a high standard, I might give Nick the photo finish edge as a Buckeye. 5) J.K. Dobbins had his turn as the main ballcarrier and notched his first 100 yard rushing game of the season. Some of that might have been Dobbins playing in the great state of Texas for the only regular season game ever, but Dobbins was having a better game than Mike Weber and that is going to change from game to game. 6) The play of the game goes to that shovel pass interception return by Dre'Mont Jones that broke the Frogs back. Jones not only stepped into front of the pass like a power forward sliding down in the paint to cut off a baseline pass in basketball, but he also showed some nifty open field moves in scoring. Front seven defenders often don't have moves like that and not hitting the end zone can cost you as Joe Schobert showed in Cleveland against Pittsburgh. 7) Jones was named the defensive player of the week in the Big Ten with the score, a pass breakup, a sack, and six tackles. Most of the game spent without Nick Bosa taking the pressure off- the OSU defensive line has to be considered with Clemson's as the best in the nation and when you get production like that from anyone other than Nick Bosa and Chase Young- that's a deep defensive line. TCU didn't have troubles moving the ball (308 yards passing) combine that with Oregon State in the opener and there is a legitimate reason for at least some concern. 9) Far too many dropped passes (Austin Mack is the big culprit this week) and with Haskins throwing an easy ball to catch, that shouldn't be happening. Ohio State keeps bringing in top-notch recruits at the position, yet dropped passes continue to plague through the last few years. 10) Finally, this "neutral" site game thing needs to stop. I'm fine with true "Neutral" games, but playing the Big 12 teams in Texas and SEC teams in Atlanta isn't either fair or neutral? Name me one SEC team that went "up north" or willing to play a home and home. LSU went to Wisconsin once, it has been a long while that anyone else did- it's time to scrap these games or make them true neutral games. 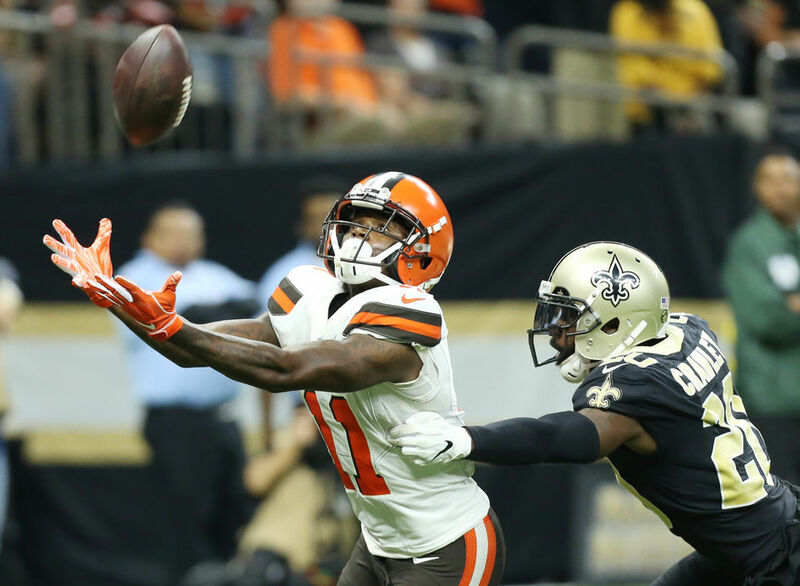 Hope to be back later with the Josh Gordon trade..
Browns Kick themselves in Saints Defeat. For the second week in a row, the Cleveland Browns had a chance to avoid defeat and for the second week in a row, Zane Gonzalez came up lacking as his 52-yard field goal drifted wide with eight seconds remaining as the New Orleans Saints slid by the Browns 21-18 in the Louisiana Superdome. Gonzalez had missed kicks (a field goal and an extra point minutes earlier) in the contest that would have given the Browns the lead before Gonzalez's 52-yard miss. 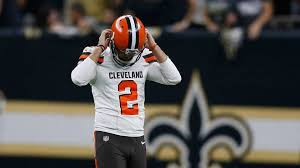 Gonzalez had missed an extra point after the one offensive play that the Browns had made happen all game long when Tyrod Taylor threw a 47-yard touchdown to Antonio Callaway, who had outrun the Saints secondary down the seam to what figured to be a lead, if not a win, although Drew Brees in a two minute offense might have something to say about that. Turns out that it did just that as Brees drove the Saints down the field and a Will Lutz field goal from 44 yards was drilled with seconds remaining to set the stage for the final Gonzalez miss. Tyrod Taylor finished with 246 yards passing with one score and one interception while Antonio Callaway led the skill players with the aforementioned touchdown with 87 yards receiving. The now 0-1-1 Browns have a short week as they host the 1-1 New York Jets Thursday night with the Jets being led by a player that you may have heard of named Sam Darnold. 1) Zane Gonzalez will have to go. You just cannot miss extra points and field goals in this league and even though neither of the two misses was easy kicks (44 and 52) you expect NFL kickers in the perfect kicking conditions of the Superdome to make it at least plausible to nail them both. The Browns are bringing kickers to Berea today to challenge Gonzalez, so they are likely to have a new kicker for the Thursday night game against the Jets. Editor's note: Zane Gonzalez will be waived with an injury settlement as apparently, he's been kicking with a groin injury. While I am sympathetic to this hampering his effectiveness, why did the Browns trot him out with an injury? 2) Underrated star? Larry Ogunjobi, who had two sacks and another called back by a penalty. Ogunjobi might be the one player that Sashi Brown will receive some credit for selecting when the Brown regime is truly able to be graded fairly. Sure, the opponents are double-teaming Myles Garrett, but good defenses have players that can brush blockers one on one and make teams pay for the double-team, but the Browns often haven't had players that have been able to take advantage- Ogunjobi might be a player that can. 3) I was just befuddled by a fourth and one play call in the first half. Not that the Browns went for it, on the Saints side of the field (would have been a long FG, but this was before Zane Gonzalez started missing kicks), I was fine with that part, but what I wasn't fine with was the play, a run up the middle with Duke Johnson, the smallest back the team has and one more noted for his elusiveness and speed, not his ability to put his shoulder down and drive forward. This brought back those wonderful memories of the Bill Belichick days when the Browns would run the smallish Eric Metcalf up the middle constantly with poor results. Liked the going on fourth down, hated the personnel used. 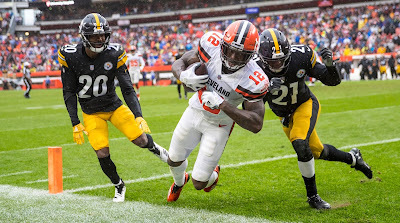 4) Tyrod Taylor's long touchdown pass to Antonio Callaway gave the Browns the lead, but the most important item to take away from that play was the speed shown by Callaway, who burst by the secondary and showed the type of deep speed that the Browns haven't had since, Ahem Josh Gordon. It will take considerable time to completely forget the off the field worries that come with Antonio Callaway, but it's pretty clear that he has plenty of physical tools. 5) This is going to be a defense that is going to continue to grow, but they kept the team in the game yesterday and allowed just 62 yards on the ground. I mentioned Larry Ogunjobi earlier, but the Browns have others that have surprised such as C.J. Carrie on one corner and defensive end Chris Smith played well in place of injured Emmanuel Ogbah. Still room for growth, but I see hope. 6) Carlos Hyde is averaging under three yards a carry, but I'm not giving up on him yet. Some of the struggles are part of the developing offensive line and others are a back that thrives on use, not getting enough carries to wear down defenses. 7) I really have liked what I have seen from Damarious Randall at free safety. Jabrill Peppers (who has been better at the strong safety as well) was miscast there and Randall has played better as the rangy centerfielder that is needed at that position. 8) The Browns defense forced only 13 turnovers in 2017, they have forced eight in two games. The Gregg Williams defense is one based on big plays/turnovers along with plenty of heat on the quarterback. I still think the Browns need another big play linebacker, but I'm seeing progress and it's entertaining progress to date. 9) Jarvis Landry saw seven targets, caught five of those, but without Josh Gordon, he needs to see more passes. Look at how the Saints use Michael Thomas (13 targets, 12 catches), without Gordon, the Browns need to feed Landry and allow him to move the chains. 10) The Browns could be 2-0, instead they are 0-1-1. I'm still not down very much on the team as I've seen good things, especially on defense. The honeymoon ends Thursday against the Jets. Sam Darnold in town, a team that they should beat at home- win and things are progressing. Lose and who knows what happens. Back later with yes, the just announced Josh Gordon trade. I usually start with the Ohio State recap on Saturday's and allow the boxing weekend to lead off next week. However, with yet another controversial decision for the Middleweight title, I decided to get my thoughts down on "paper" now as Canelo Alvarez dethroned longtime WBA and WBC champion Gennady Golovkin via a majority decision in Las Vegas. I would disagree with that take, but I can see how you'd arrive at it, but the frustrating thing is that it rarely (every once in a huge while) goes the way of the non-house fighter, which means it usually goes the house fighters way if it is reasonably close. That after all, is the "Time-honored tradition of the business" (remember Vince McMahon drumming that phrase into heads after the Montreal screwjob with Bret Hart? ), if you want to beat the house fighter for sure- you better knock him out and for all of the power of Gennady Golovkin, in 24 reasonably close rounds, he never once turned on the gas and went for the one option that they could not take victory away from him. 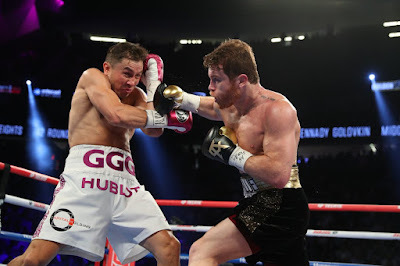 If I could change one thing about these fights and it might not have been as effective, I would like to have seen Golovkin go after Canelo, not worry about scoring points, stalk him like a tiger and see if that would have gotten him out of there. That reminded me a little of Roberto Duran as he rose in weight, he was more technically proficient than as a lightweight perhaps, but the animal that Duran was at 135 was never more. Golovkin's change didn't come with a rise in weight, it came with a rise in competition in matches against Daniel Jacobs and Alvarez and it almost seemed like he was too civilized to paraphrase Mickey in Rocky III. I would like to have seen That Golovkin against Canelo and take my chances. Canelo Alvarez was the boxer, not the aggressor in the first fight and was the fighter that won many late rounds to earn a draw in a bout that almost all observers thought was a charge that could best be described as too little, too late. In the rematch, Canelo was much more aggressive and came forward to engage far more often in winning more early rounds before losing most of the later rounds. Yet. in both cases, whether he was aggressive or defensive, whether he was building a lead or commanding a late run, it was Alvarez that received the benefit of the doubt, not Golovkin. How can a fighter win against the tide, when there is no consistency in what the judges are rewarding? Other than rewarding the promoter's fighter that is. that is almost always consistent and you can generally count on that. This fight really reminded me of the first (and only) Marvin Hagler-Ray Leonard contest and not in the ring because this fight was more entertaining than Hagler-Leonard. Where it reminded me of Hagler-Leonard was outside the ring. Hagler's management was determined to get as much money as possible from negotiations for their fight and basically gave Leonard everything else, rounds (12 instead of the then-still used 15), size of the ring because Hagler and his team had been the outsider, the B-side throughout their career and how they proved they had "made it" was for their guy to out-earn the "Golden Boy" (Ray Leonard was Oscar De LaHoya before we knew who he was) for the fight and instead gave every advantage to Leonard, essentially not giving their fighter the best chance to win. Golovkin and his promoter Tom Loeffler took a different direction with the same result. Like Hagler, it was Golovkin that was the workhorse, beating fighter after fighter, being avoided by the best and actually seeing the peak of their fighter being wasted against lesser fighters while the best of the game ducked their man (Hagler was ducked for years by three different champions in Hugo Corro, Vito Antuofermo, and Alan Minter until mandated to get his shot while Golovkin held a title but never could get Sergio Martinez or Miguel Cotto in the ring). Loeffler's moves in any rematch were to gain some of the advantages back- Golovkin earned a larger purse share (45 percent this time) than in the first fight, he had more control over the selected referee and was able to have right of first refusal of the judges chosen, but what Loeffler didn't realize or maybe he did and figured if his man didn't take the other fighter out, he was going to lose anyway, so why not have the best chance in theory, if not execution. Which is why after such problems making the rematch, Canelo's PED suspension and despite Golovkin still holding two titles, Alvarez still held most of the cards- he was the draw, he had the promoter and he had the power. And that is why I don't believe there will be a third fight right away or even at all -Golden Boy Promotions now holds all the cards, Canelo didn't want to fight peak GGG and he arguably lost twice to the 35 and 36-year-old models of him, if there is a 3rd fight, it will be years down the road far after the peak of Golovkin is just a memory on YouTube. Oscar De La Hoya used Ray Leonard's M.O for his career and now uses it for Canelo- Only offer rematches when you lose (or Draw), if you win, no matter how it is pulled off it's onto new things. Which is why if there is a third fight, it will be years away with GGG being considered a non-threat, remember that the only reason Thomas Hearns was given his rematch with Leonard was after being knocked out by Iran Barkley and was thought to be washed up? Roberto Duran was given his chance for redemption nine years later when he had slowed to the point of having little chance against quicker fighters although he was still capable of surprising wins against fighters that didn't move around the ring. And the final parallel to Marvin Hagler for Gennady Golovkin for me? When I heard the decision (I watched the fight a few hours later), I instantly thought of Marvin Hagler and how he handled losing a dubious decision- he walked away and beat Ray Leonard for good in the only way that he could. He passed on oodles of dollars for a rematch and walked away-never to fight again. The ultimate screw you to Ray Leonard, boxing and its rigged game, I'm not giving you any further memories and I'm not giving you the chance for one more chance to do it again- no matter how much money you give me to do it. I'd love to see Gennady Golovkin do just that as the final link to Marvin Hagler and in the background, you can play the standard song for such occasions- My Way. Golovkin has made plenty of money and despite these two fights with Alvarez that most feel that he won, the feared destroyer is in the past and now that his undefeated record is gone, there really is not a reason to stay, I'd like to see him just walk away. In the boxing challenge, Ramon Malpica and I each scored eight points. Ramon scored three points for Jaime Munguia's three-round squash match against Brandon Cox (Bonus point for calling the round), two for Friday's win by Jose Ramirez in a terrific fight against Antonio Orozco that deserved more of my attention here and for David Lemieux's one punch devastation of Spike O'Sullivan and one for Roman Gonzalez's win. My eight came via these avenues; three from Gonzalez's fifth-round KO (bonus point for calling the round), two each from the Ramirez and Munguia wins and one from the Lemieux victory. I lead the challenge 141-119. The constant turmoil around the Cleveland Browns that was present from the trials and tribulations of wide receiver Josh Gordon ended Saturday evening when the team announced that they will be releasing him first thing Monday morning. The Cleveland Plain Dealer is reporting that Gordon aggravated a hamstring in a Friday practice and showed up today "Tardy and Not Himself" and seeming to be on "the verge of relapsing". Since I am neither there or a drug counselor, I'll refrain from speculation on the behavior and the reasons and stick to football. I can't blame the Browns for the decision. Josh Gordon has received every break that you can think from the Tom Heckert regime to Joe Banner to Sashi Brown and even one final chance with John Dorsey and he still cannot seem to get things right. As always, all people have flaws and just because you are gifted on the field ( look at the final TD catch that he would make as a Brown last week vs Pittsburgh) certainly does not mean that you have the same gifts in other areas of your life. Nonetheless, talents such as possessed by Gordon tend to be given opportunities for redemption that few of us in the average world would come close to receiving and it's rare that the story ends well, no matter how many of us wish for it and how many puff pieces are written and televised about the process of rehabilitation. And I'll even go you one better if you've got the nerve (I've been waiting 11 years to get that Jan Berry song lyric in the blog)- Dorsey might have been brilliant for announcing the intent to release rather than actually doing so. If someone (and it's all over Twitter at this time that several teams are interested) wants to give the Browns something, even if it's one of those seventh-round draft picks that the Browns seem to be collecting of late, something beats nothing. 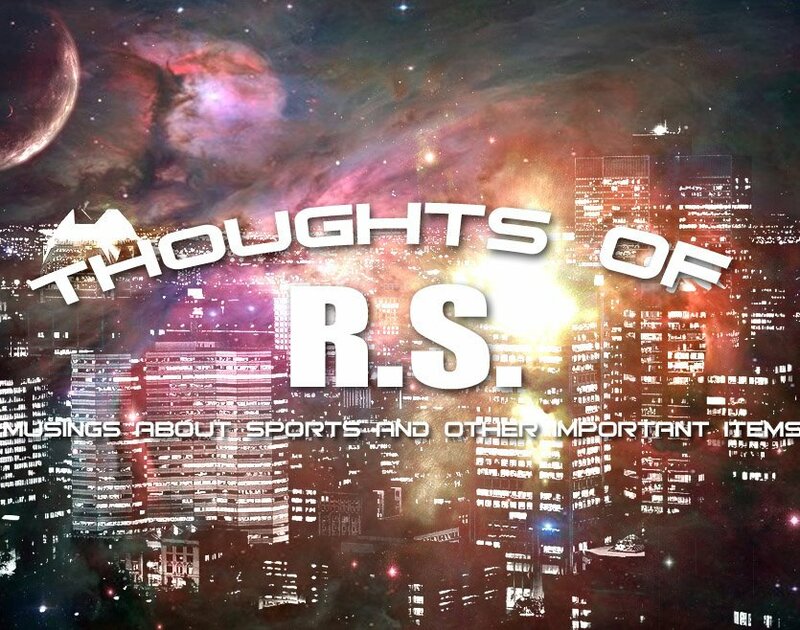 Just for that maneuver that gives the Browns a chance of getting something, John Dorsey gets plenty of credit and being that someone is always out there that believes that they have the magic potion to change a person that doesn't always want to be changed, one never knows what they could bring back. I'd be thrilled with a day three pick that could escalate higher if the acquiring team is able to patch Gordon together enough to reach some stipulated statistical levels and if that happens, that's all due to John Dorsey. However, the Browns could be faulted for not doing enough to be prepared for such a circumstance. I've heard a few points tonight on this. One was that you cannot fix everything in one offseason and that's true. However, you also cannot spend another season doing what past regimes have done- counting on Josh Gordon and being screwed over when he messes things up either. If Antonio Callaway can keep his past problems in the past, he could be a player that helps offset the loss of Gordon, but again you are asking a player with issues to not have issues, so I'm not tremendously comfortable with that either. Another talked about culture change and that it is needed. While I agree on the need and boy, has that phrase has become vastly overused in sports, what I wonder about is would John Dorsey be so quick to cut ties with a player that he brought in? Dorsey was known for gambling on questionable character players in Kansas City and did again with Antonio Callaway, so is it any player or just players Dorsey didn't bring in and which he doesn't have the personal investment in? That's the part that I'll be interested in watching over the Dorsey term. In the end. Josh Gordon was the type of the talent that teams drool over and talent-wise, he might have been the most talented physical receiver in the history of the Cleveland Browns. However, outside things were more important than playing football and the Browns didn't have the key to solving those problems to keep him on the field as a productive player. Browns fans will have memories of a few flashes of brilliance and to paraphrase for the athletically inclined the classic poem by John Greenleaf Whittier "For of all sad words of tongue or pen, the saddest are these- What might have been!" Boxing Challenge: Porter decisions Garcia. It's a tie? Browns tie Pittsburgh in opener.